I recently did a knitting design pitch--and it was my first in a very long time! Something about it just appealed to me, but gosh, I felt rusty. 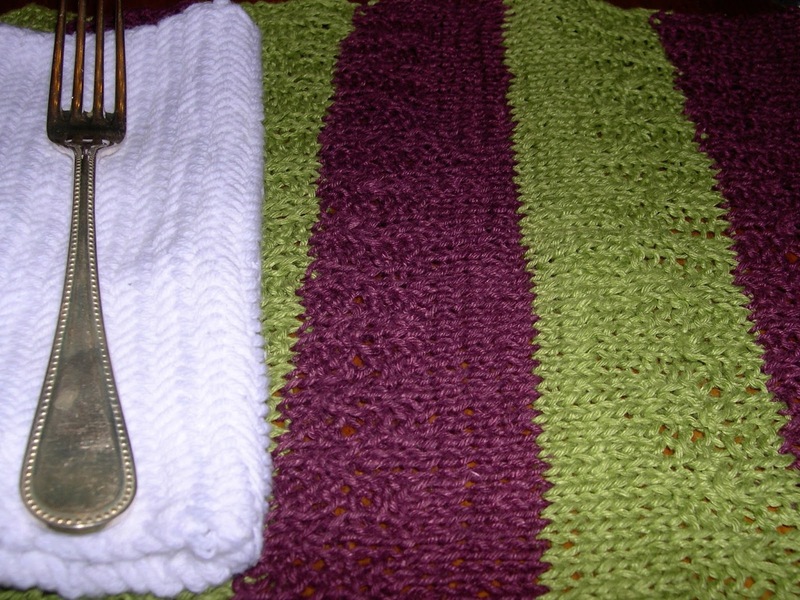 So, I knit a very big swatch out of Morehouse Merino Bulky yarn. This is the old-style singles yarn, my understanding is that they have transitioned to a two-ply that knits at the same gauge, but in any case, it is luscious! I cannot believe I have held onto it for so long...but this week was the right time to knit it. Scrumptious stuff and a really fast knit. She was in town to shoot a movie but is now back to Hong Kong, her home base, I think. She has dogs, she loves wine...amazing how "the famous people" are just all really future spinners, don't you think? As the partner of a professor, the two of us are sometimes wrapped up in knots over what's going on in universities. How things are funded, how a professor's teaching load and classes are assigned, how to manage the hundreds of emails and students and details. What is particularly interesting is that by choosing not to get a PhD or become a professor,* I have a different perspective. From outside the ivory tower, sometimes you can see how individual professors or departments have lost track of their mission. For instance, professors are, in part, teachers, but often lack any kind of training in how to teach. So, they struggle with how to be effective instructors...and their assignments sometimes don't match the objectives they hope their students will master. Their students don't learn all that they could, because the professors lack the teaching tools they need. Some professors don't even like teaching! Professors aren't perfect, by any means, but they are experts in their particular field of research. 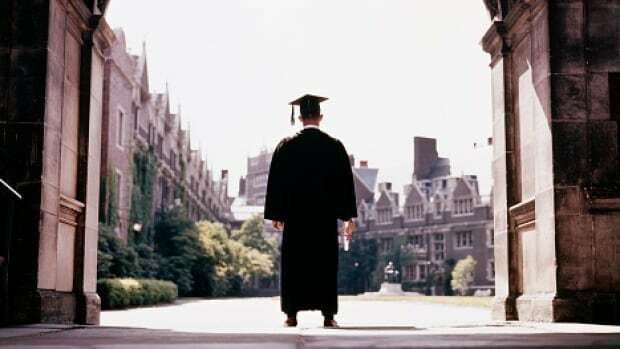 Yet, in an era of cost-cutting at universities, there's a tendency to push professors to do many things they aren't trained to do: master travel vouchers and reimbursement software, deal with all their grant funds with no training in accounting, nurture students with special needs or challenges (again, without any training) and more. Getting a PhD means you are smart--in your specific field of expertise--but it doesn't mean you are good at everything. Sure, smart people can figure out how to do a lot of things, but how long does that take? I often wonder what would happen if professors were unleashed from some of the bureaucracy and allowed to really innovate in their areas of strength. There would likely be new patents and ideas, technology and business start-ups. There would also be some great teaching, because some professors are, at heart, very good educators. If there were competent people in supporting roles, managing grants and travel and all the details that keep a university functional, well, professors might get to spend a lot more time on teaching and research-- in our house, that might mean more science and less time fighting over small bureaucratic change. ...The Hemp Placemats are now available as a single pattern download! I'm running a sale through the end of March. 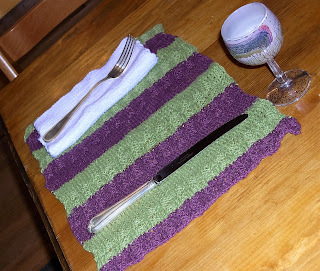 on Ravelry and put both the Hemp Placemats and the knitted napkins patterns in your cart...and you'll save 30% off the purchase of both patterns. Cause, you know, spring is a great time to celebrate holidays of all sorts, and to plan on a dressy new table setting or two. I'm old-fashioned that way....I love a pretty table setting. When I was a kid, I was sometimes reprimanded by my elders because I was not the most subtle or thoughtful. If somebody asked me something, I occasionally responded without the right "polite" filter. So, sometimes I maybe said mean things inadvertently, without thinking, or I was way too honest when asked my opinion.
" No, Auntie So and So, you don't look good in that color. I don't like your new dress..."
You get the picture? Those comments did not go down so well. However, there's something to be said for telling it like it is. My mother-in-law (may she rest in peace) was very good at this, and now I get it...often people encourage girls to be nice, act nicely and be polite...don't make waves. Yet? There's some serious feminist power in speaking my piece. Even so, I am sometimes too kind due to this childhood "girly" training. I try to excuse people by saying things like "I'm not entirely sure what they were doing" (when I knew, in this case they were definitely pirating ebooks) and making excuses like "I was really sleep deprived. Maybe I missed something." The truth is, heck no, I did not miss anything. As individuals, we often see people doing wrong. If I were not so tired that day, maybe I would have called out those people who were stealing digital content, but in truth, I wasn't up to doing it. I should have. I should have even been more direct about it in this essay I wrote. Oh well. Some of the comments posted in response may have their points. However, some are downright mean and petty. The professor pointed out to me that I should read all the comments through this lens: Why are they commenting? Do they feel defensive because they are guilty of stealing someone's intellectual property/content without paying for it? Even further...why do these trolls comment on articles all the time in this way? Why not write your own opinion piece? Why not speak out about your point of view instead?! Are you willing to put your writing out there for publication and be open to the critique? This comic gave me a laugh, and it reminded me too of how far I've come in my work life. When I first started writing for publication, I was very sensitive about every comment, criticism and critique. It all hurt. Now, I know that nothing I ever write is perfect, but that it's ok to write what I know...and sometimes it gets accepted for publication...anyway. When I see the article go live, part of me is proud it was published for its own sake. Another part of me is going: Grocery money! Preschool fees! Maybe we can afford take-out now and again! Cause the Canadian dollar is low these days, and groceries cost more and more. It's a fine thing to be able to put my education and experience to work, and earn money for that work. Some folks might not agree with me. Oh well. I can live with that, particularly if I still get to earn money for my writing, and it pays some of the bills. It's a feminist thing: getting paid fairly for my work. That's saying it like it is. I think this is the preschooler virus winter. There are kids at school who have been more sick, with antibiotics and there are kids who have bypassed it all. For us, it has amounted to a day or two on the couch with one or two sick kids nearly every single school week since January, and many weekends. Both boys had a pretty quiet weekend and stayed home on Monday, and I assigned them each a living room couch. They went back to school Tuesday, and they seem to be doing ok for now. That might change at any time. We normally pvr the specific educational kids' shows that we let them watch, but I have given in to the inevitable...when somebody is home now, we have "sick TV." That is just leaving on CBC kids or PBS or Family Jr (the three kid oriented channels we get) on. I know some kids watch this much TV every day--crazy! but we only do it when somebody is too sick to make it at preschool. Older kids read when they are sick (I certainly did) but my guys aren't readers yet. So, we take naps, have snacks, and watch a lot of "sick TV" on the couch. Oh well. They seem to learn stuff from it. As soon as they are well enough to play normally, the two of them raise heck, so then it's time to go back to school! Sick TV lets me do the bare minimum in our house. I used to think that a sick day would allow for endless knitting time. Not so. It allows me to do the three extra loads of laundry (sick kids, remember?) and figure out the next meal and snack. It lets me do crazy things like trying to answer emails in a timely fashion. It lets me (gasp here) go to the bathroom by myself, although even that requires strategies. The fuschia/burgundy skein is a one ply single of burgundy/fuschia medium wool, with multi-color wool locks spun in. It was then plied with a commercial yarn: a matching high twist mercerized cotton embroidery floss with a lot of shine. The white/pink skein is one ply of Romney/Texel wool (Manitoba wool) spun from the lock, plied with a commercial pink cotton/viscose yarn with little added bits of silk warp leftovers/thrums. Then, there's one skein of Border Leicester wool (naturally brown, washed, picked, carded and spun by me) plied with an aqua commercial silk yarn, and a 2 ply Border Leicester skein of yarn that matches this. I dropped those 4 skeins of at Ram Wools this week; they're for sale if you're interested. I think the art yarns would look great with a laceweight yarn or thread, knitted up as scribble lace. If you buy two matching skeins, it would be enough for a cowl or hat. When my fiber time is so short, I look at old projects in a new way. I want to save old things, darn and fix and renovate. 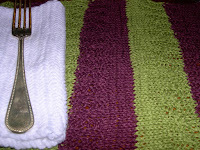 My best guess is that I started the first version of Heart's Ease Socks in 2006, according to this blog post. My Heart's Ease socks have been worn faithfully most Februaries, right around Valentine's. However, this year found me pulling the socks out of my drawer permanently. Knit Picks' Palette yarn is not a super wash wool, and my sock had fulled (nearly felted) through wear. I wear my clothing very hard, so this isn't a real surprise, but now the socks were hard to pull over my heel to get on. However, they seem to make mighty fine mitts. I cut a hole in the heel, picked up stitches on a set of 2.5mm double point needles, and knitted a thumb tip for each sock. I went back after I knitted the thumbs and reinforced that join between the old heel stitches and the new thumbs. I haven't gotten a chance to wear them yet, but I think they will be a warm and cheery winter layer. The reason I haven't worn them yet is that it has been unseasonably warm! Only around freezing (OC, 32F) and that is shockingly warm for March in Manitoba. All the snow is melting early, and I hardly need double layer mitts anymore. What a surprise. I was extremely lucky in that weather on Tuesday, when my whole day spiraled out of control. I brought the boys to preschool (kicking and screaming that they were TOO SICK, MOMMY! I ignored that. If they are well enough to scream like that? They're fine.) and dropped them off at school. There, I discovered there was a parent board meeting, and I felt guilty so I went. When that ended, I rushed to the grocery store. I did a big shop, got everything into the car, and sat down to look at the receipt, where I discovered an error. Rushing in to try to get it fixed? I locked my keys in the car. AHHHH! The professor was in the middle of lecturing to his class, and his car was in the shop, so no help there, he couldn't help me. I hiked through the yucky dirty melting snow drifts to the boys' preschool. A teacher (an angel in disguise!) was outside and drove me home. I dug through another dirty snow drift to find that special hidden key...let myself in, got the spare key, the teacher drove me back to the car in the grocery store parking lot, and I could drive home. Thank goodness. Then I unloaded all those groceries, rushed to a physio/physical therapy class, and came back to pick up the boys. That was it. The whole day. Gone. No work time to speak of.